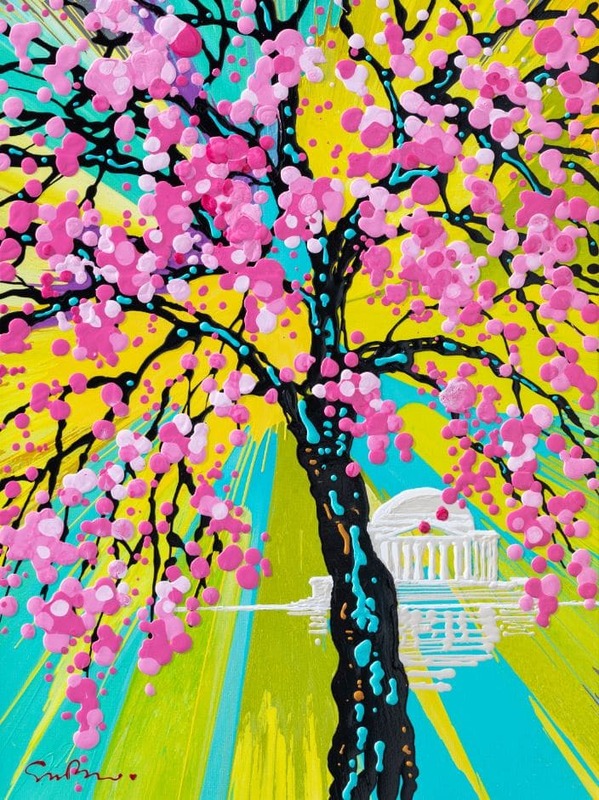 Artist Simon Bull has been given the honor of serving as the official artist for the 2019 National Cherry Blossom Festival in Washington, D.C.
Held March 20 to April 14 at the nation’s capital, the annual festival commemorates an event in 1912 where Mayor Yukio Ozaki of Tokyo gifted 3,000 cherry trees to the city of Washington, D.C. The first trees were planted during a simple ceremony on March 27, 1912. Today, the weeks-long festival holds more than 50 events and programs that promote the arts, international friendship, and natural beauty. More than 1.5 million people attend the public festival. As a celebration of nature and the arts, the National Cherry Blossom Festival would have a hard time choosing a more appropriate artist. Bull, a British-born artist who now resides in California, has always been fascinated by nature. 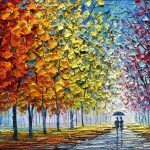 Throughout his career, he has portrayed everything from realistic landscapes to colorful abstract flowers. As the official artist for the festival, Bull says this gives him yet another opportunity to explore the natural world in his art. In creating the event’s official artwork, Bull decided to explore themes of stability and impermanence. He said he wanted to show the contrast of how trees grow slowly and have tough branches, but their blossoms are temporary and fragile. “I wanted to create a painting for the festival that brought these elements together in one piece, but also added a third dimension—an emotional one,” Bull says. 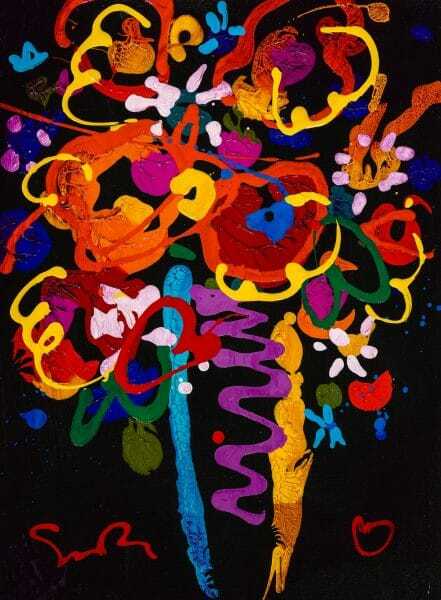 The artist achieved this by creating a vivid pastel background with a spinning effect. 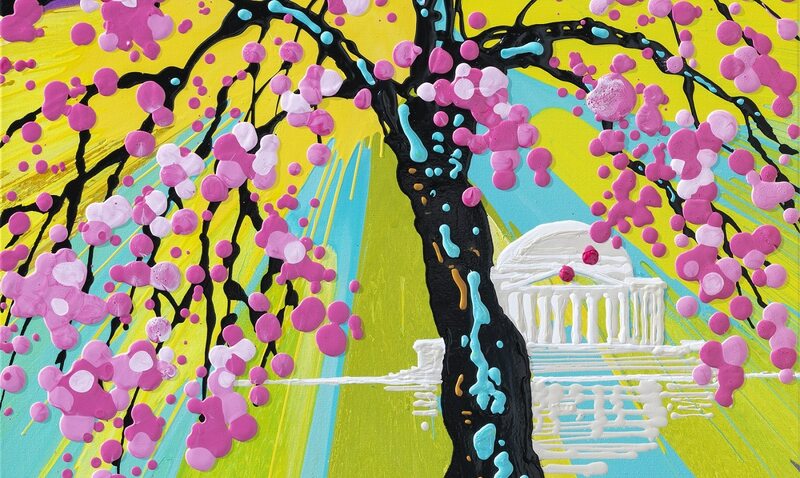 On top of this background, Bull used thick layers of liquid paint to create a dark tree with bright pink blossoms. Behind the tree, Bull depicts Washington, D.C.’s Thomas Jefferson Memorial. “It was a bit of a challenge to not lose the delicate blossom effect against all that color, but I think the final piece conveys a sense of celebration and feeling that spring is truly in the air,” Bull says. The official artwork is featured on everything from the festival’s poster to key chains, mugs, and bags. The work is a reflection of his more recent artistic experimentations. 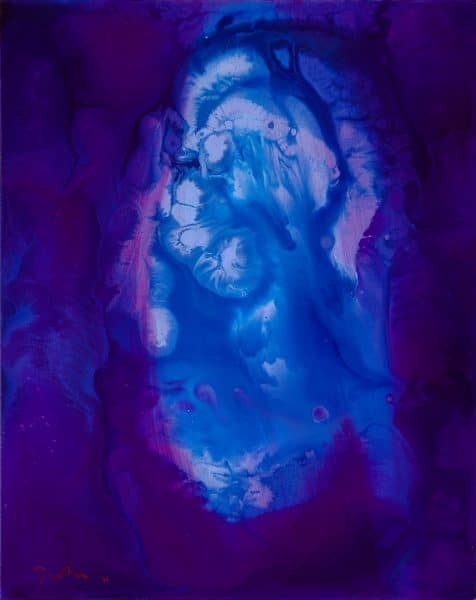 True to form, he has been letting nature dictate the course of his paintings by having gravity and evaporation determine how paint settles on the canvas. Bull is holding a workshop on Saturday, March 23 from 1 p.m. to 3 p.m. at the prestigious Smithsonian American Art Museum. He will speak about his experience as a professional artist and guide attendees in creating ink drawings. 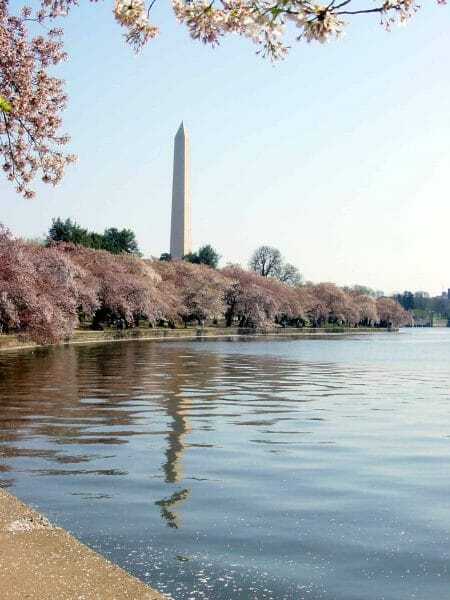 When asked about any upcoming projects following the festival, Bull says collectors might see beautiful cherry blossoms crop up in his future works—at least for the time being. “The blossom tree thing is still working its way through my system, I’m just following the road wherever it leads—that’s the best way,” Bull says. 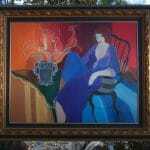 For information on collecting the art of Simon Bull, contact our gallery consultants at (800) 521-9654 ext. 4 or sales@parkwestgallery.com. National Cherry Blossom Tree Festival, Park West Gallery, Simon Bull, Smithsonian American Art Museum, Washington D.C.